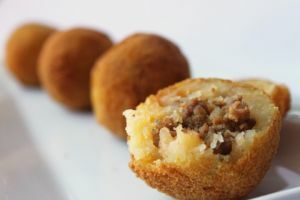 Papitas Rellenas | Meat Stuffed Potato Croquettes is a Peruvian food recipe for fried potato balls with homemade salsa. Boil the potatoes in salted water until soft. Drain and immediately press through a ricer. Add the flour and beaten eggs and mix by hand until all the ingredients are combined. Season with Salt to taste. For the filling, heat the oil in a saute pan over medium heat and cook the onion until translucent. Add the ground meat and cook until the meat is almost cooked through. Add the piquillo peppers and the chopped herbs. Season with salt to taste. For the salsa, combine all of the ingredients in a non-reactive bowl and season with lime juice and salt to taste. Set aside for garnish. To assemble the croquettes, flatten a ball of the potato mixture in the palm of your hand. Place a spoonful of the ground meat filling in the center and enclose all sides, balling the mixture in the palm of your hand. Lightly dust the balls in flour, pass through the beaten eggs and dust in flour again. Heat the oil in a heavy skillet to 375F and fry the balls until they are browned and crispy on all sides. Serve immediately with the salsa.